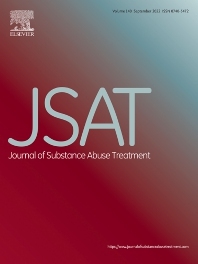 The Journal of Substance Abuse Treatment (JSAT) features original research, systematic reviews and reports on meta-analyses and, with editorial approval, special articles on the assessment and treatment of substance use and addictive disorders, including alcohol, illicit and prescription drugs, and nicotine. JSAT values high quality empirical research that is relevant for translation by treatment practitioners from all disciplines and across any setting where persons with substance use problems are encountered. The editors emphasize that JSAT articles should address assessment techniques and treatment approaches that have clear relevance for routine practice. Accordingly, the scope of JSAT includes health services research, including the design, organization, delivery mechanisms and workforce characteristics of treatments in routine settings. It is the policy of JSAT that treatment research for individuals with substance use disorders meet the same scientific evaluative standards as treatments for those with any other health-related condition or illness. Thus, research articles submitted for publication in JSAT are expected to achieve the same empirical standards of reliability, validity, and empiricism. Theoretical models, clinical experience, and case vignettes are recognized as important supplements to, but not as substitutes for, research-based evidence. It is recognized that research-based evidence may take many forms, such as randomized controlled trials; case-controlled field evaluations; or time series evaluations. In early stages of research development, qualitative study or small trials may be appropriate and necessary first steps. Regardless of the specific type of study, authors of research articles should aim to: (1) Use one or more reasonable comparison or control conditions in the design and analysis of collected data, (2) Use data collection methods and measures that have been previously validated in the subject population, and (3) Analyze data (qualitative or quantitative) with the use of appropriate statistical methods. Authors must insure that the research as reported was conducted ethically, and that all protections to human subject participants were afforded. This insurance must be verified by the appropriate institutional review board or committee for the protection of human subjects. In addition, the editors of JSAT will not consider articles that use pejorative and stereotypical expressions when discussing individuals who suffer from substance use disorders. In drawing conclusions, authors are expected to use a parsimonious, cautious and conservative approach in the interpretation of findings. Hyperbole and overgeneralization beyond the data are considered irresponsible.